This tour is LARK’s once off return to SA after precisely 1 year since their last show at the 2008 RAMFEST. The band was approached by RAMFEST towards the end of last year and asked if Paul would consider doing a LARK show at the festival if they flew him back from the UK, where he resides now. 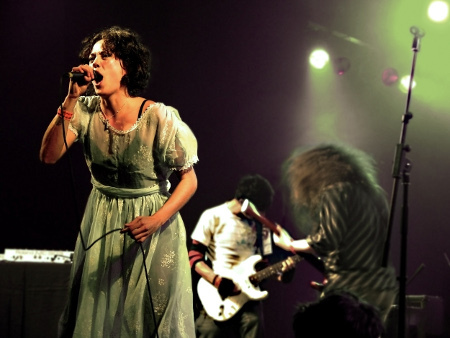 The band jumped at the chance to play with one another again and hence decided to do a tour around this performance. They have titled the tour “BRAVE” after the bands new single. LARK are also using this opportunity to release a live DVD of their concert held at the Pavilion Theatre in JUNE 2007 titled “A Dagger and a Feather” where they invited guest artists Johnny de Ridder (Fokofpolisiekar) and Kyla Rose Smith (Freshlyground) to perform alongside the band and a classical string section with VJ Grrrl on visuals. The stage was decked out in playroom props to emulate a children’s playroom with an eery look and feel to it. The concert was recorded in 5.1 surround. This is to date the most extravagant performance of the bands career in terms of the time and effort that went into this show to ensure first class showmanship and visual representation of the bands creative performance ideals. 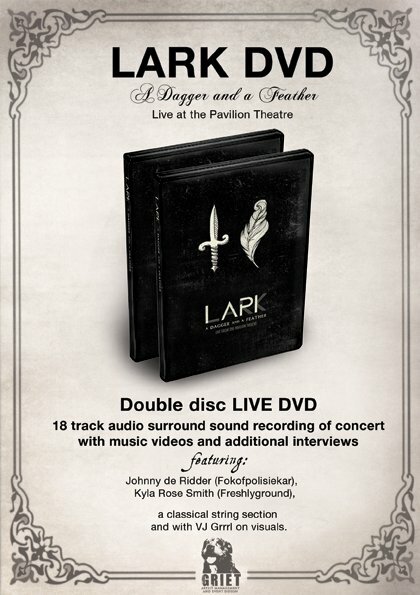 This DVD will be a double disk release with a LIVE audio surround sound recording of the concert with music videos and additional interviews with all those involved in the “A Dagger and a Feather” concert. The DVD will be available for R150 at the shows. Yesterday’s Pupil has been selected at the official opening act for the Gauteng and Kwa-Zulu Natal leg of the tour. He is a one man performer that coordinates live production and sampling with acoustic drumming, live guitar and vocal arrangements. His debut album ‘Errors of Enthusiasm’ is a profoundly fresh approach to electronic music-making and his combination of traditional rock with new wave electro and noticeable pop sensibilities results in music that is approachable and great stuff to groove to! His work is very new in the South African music scene and we have found him to be one of the most impressive and original acts on or local stages. Hey, Any idea where we can buy this and/or their albums?? Hard to track down it seems. Please. Where can we get a copy? You are welcome to contact Dominique Gawlowski at the following email address: dom@griet.co.za for more information regarding Lark. You Win Because Mtkidu Wins!